HR Whiskey Creek's Legacy of Barrel Select JH WDQ "Elli"
Elli is our All American girl born on the fourth of July, 2011. She is invaluable as a hunting companion and meat dog, as well successfully competing in hunt tests, nosework, and training for tracking. In training, Elli picks up on concepts extremely quickly. She is highly tractable, birdy, and runs beautiful lines. Elli has her HRC Seasoned (HR), Junior Hunter (JH), and Working Dog Qualified (WDQ) titles and is currently training for both MH (AKC) and HRCH (HRC). 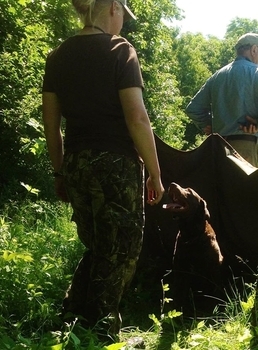 In the upland field, Elli is dynamite at quartering, pointing, and retrieving upland birds and game. 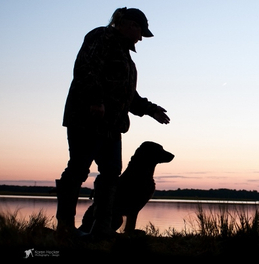 With her muscular, athletic build, Elli is seemingly tireless and will work from a boat, blind, or upland. Now retired from breeding, Elli is proud mother to our boys Woody, Hemi, and Bear.